Editorial cartoonist Lou Erickson once said “Gardening requires lots of water – most of it in the form of perspiration.” While statistics on sweat have not been published, we do know that water used for landscaping accounts for over half of municipal water use in the hot Panhandle summer months. 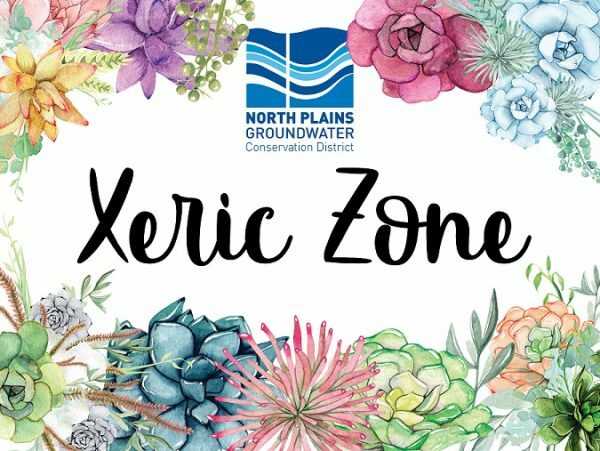 The new Xeric Zone program from North Plains Groundwater Conservation District will recognize residences and businesses that have made a commitment to use xeriscaping to reduce outdoor water consumption. If you know of a business or residence that uses any water-friendly landscaping practices, please send us a tip to info@northplainsgcd.org or call Julia at 806-930-6934. You can also find a nomination form here. We’ll get in touch with the home or business owner and adorn their landscape with a special Xeric Zone sign. Feel free to nominate your own xeriscape, or any that you see! Read below to learn more about what xeriscaping means and how you can make your yard a Xeric Zone. A xeriscape is a landscape design that does not require much water, usually utilizing native or drought-tolerant plants and hardscape elements such as rocks or pavers. A fully xeriscaped yard will usually group plants by water use. The arid zone of a landscape should thrive on natural moisture alone, with no irrigation required after plants have established roots. The transitional zone has plants that may require partial shade and infrequent watering. Planting beds or areas close to the home can serve as an oasis zone, with rainwater falling from the roof line serving as additional irrigation for more thirsty plants. Xeriscaping also promotes soil health through the use of organic amendments and moisture-locking mulch. The biggest water-waster in a landscape is the turf. Look into turf replacements like buffalo grass and various groundcovers. Replace high-maintenance annuals with perennial xeric plants that will come back year after year! Some of our favorites are Red Autumn Sage, Chocolate Flower, Prairie Zinnia, and Iceplants. Consider replacing turf with pavers or flagstones in high-traffic areas. For the ultimate low-maintenance yard, add rock garden elements and well-chosen succulents or cacti. With our shared water source constantly depleting, water conservation must be a community effort. We appreciate your assistance in helping us recognize champions of water conservation!